I thought about just making changes to the original article but as I did so I realized it was getting convoluted with misordered references and a new taxonomy that not only split up clades but would have split up sentences. So I will add a little addendum to the first essay. In the subsequent years since I wrote that piece there have been a three major developments effecting the content and theme. Firstly, with regards to the chemicals themselves. Over 800 alkaloids have now been sourced to dendrobatid frogs. Bioprospecting and retrieving extracts from invertebrates have revealed a number of alkaloids detected in frog skins. Beetles, ants, millipedes, and mites have all yielded alkaloid structural classes and compounds found in frogs. The evidence strongly points to the microinvertebrate foods of these little frogs are what are supplying the chemical defenses they need to safely go about their lives. A 2007 paper by Ralph Saporito lists oribatid mites as a major source of alkaloids in frogs, especially those of Oophaga pumlio. Approximately 80 alkaloids representing 11 structural classes were discovered with about 40 of these alkaloids found in the frogs themselves and the rest new or unknown from frogs. Several articles were published late last decade pursuing this theme of source alkaloids. It appears the mystery of the extremely potent batrachotoxin is nearly solved as well – sort of. In 1992 it was discovered that the chemical found in the endemic New Guinea Pitohui bird was batrachotoxin. How was it that a frog shared this strange alkaloid with a bird half a world away was solved in a 2004 publication. Colombia had become too politically tumultuous and dangerous to continue work by the 1990’s so research on the frogs, especially Phyllobates terribilis had ceased. However, New Guinean villagers identified a beetle that produced the same numbing and tingling sensations one received from handling the Pitohui birds. Researchers examined the beetles and found a host of batrachotoxin analogs. These beetles in the genus Choresene in the Melyrid family had gone undetected in earlier bird surveys, likely due to the relative low densities of the beetles in the wild and the minor component of the birds’ diets. In fact it was the local knowledge of traditional peoples that shed light on the mystery. Researchers posit that surveys of the Colombian Chocó will reveal beetles in the same family or even genus. Since the beetles do not appear to manufacture their toxins this would then raise the question as to the source plants and their global distribution. In fact, far from being a mystery solved, the simple question as to the chemical source in frogs is raising many more questions on a much broader scope in regards to evolutionary theory and biogeography. A second major issue came about in 2006 with the publication by Taran Grant, et al., of a major revision of dendrobatid taxonomy. This monumental work placed the dendrobatids into one Superfamily, the Dendrobatoidea, with two families, Dendrobatidae and Aromobatidae, with 3 subfamilies each. There are now 17 genera and over 250 species. The familiar genus Dendrobates is restricted to just 5 species with the rest split into several genera. Notably the smaller ‘thumbnail’ species predominantly fall within the genus Ranitomeya and the obligate egg-feeders are now in Oophaga. Some of the non-descript frogs, e.g. previously Colostethus, are now in multiple genera. A good and simple run down of the changes can be found at http://www.dendrobates.org/dendrobatoidea.html. While this paper was controversial when it was published much of the data appear valid and the changes are accepted in the literature. Lastly with respect to my first essay, the greatest pioneer in dendrobatid pharmacology, Dr. John W. Daly, died on 5 March 2008 from pancreatic cancer. I had the pleasure of speaking briefly with him a couple of times. While if he were alive he would not know me or recognize me, I can say the meeting was an honor. I have been become an advanced hobbyist of dart-frog toxins thanks to his works. He had published well over 600 papers during his extensive career. His collaboration with Dr. Charles W. Myers was profound and was arguably one the greatest herpetological partnerships in history. Bob Hansen, the editor for Herpetological Review, allowed me the honor to have one of my images published as the cover for the March 2009 issue of Herp Review. 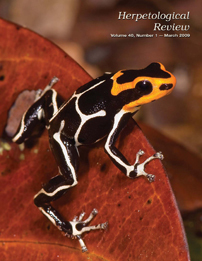 The shot, of a dart frog, was also the issue where Dr. Myers penned tribute to his friend and colleague Dr. Daly. There is much more to be gained from dart frogs and their complex pharmacology. As researchers gain the knowledge, we find that instead of closing the book we are ending a small chapter. As is typical in science, answers lead to many more questions. While it would be easy to see this as an exciting time there is cause for dismay. Many populations of these frogs are disappearing and some are going extinct. These losses not only will hamper direct learning of frog biology but will prevent many broader questions from being answered and perhaps will cut off paths of future exploration. And that is why I pursue my photography and the reason for this site. I hope I can inspire you to understand the importance of saving these mystical creatures.